Vietnamese food is insanely delicious! 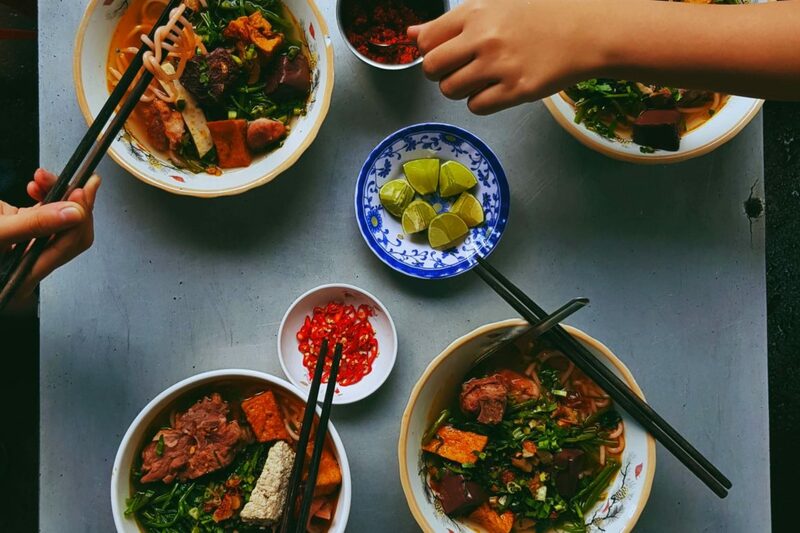 From tasty noodle soup to delicious rolls, explore the best Vietnamese street food you should try with our Vietnamese food guide. 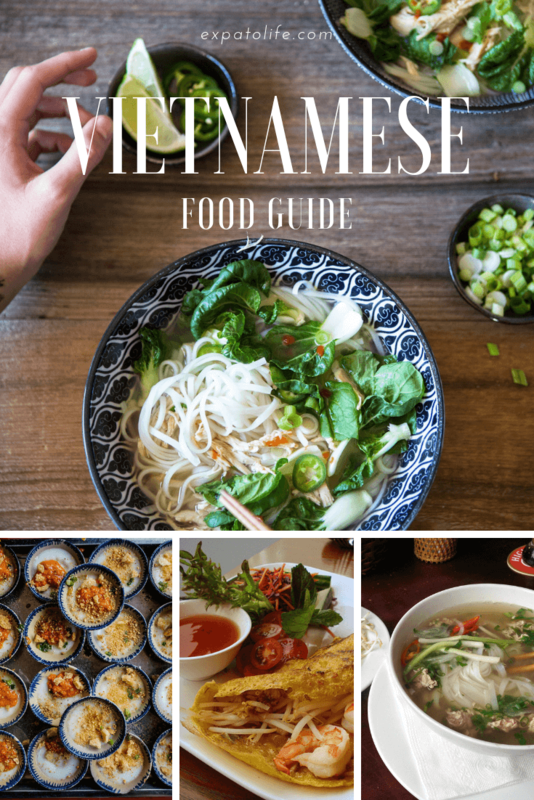 When it comes to Vietnamese food, Pho is probably the name that people always think of first. Pho is made from rice noodles, broth, beef or chicken and other spices. There’s vegetarian Pho as well. 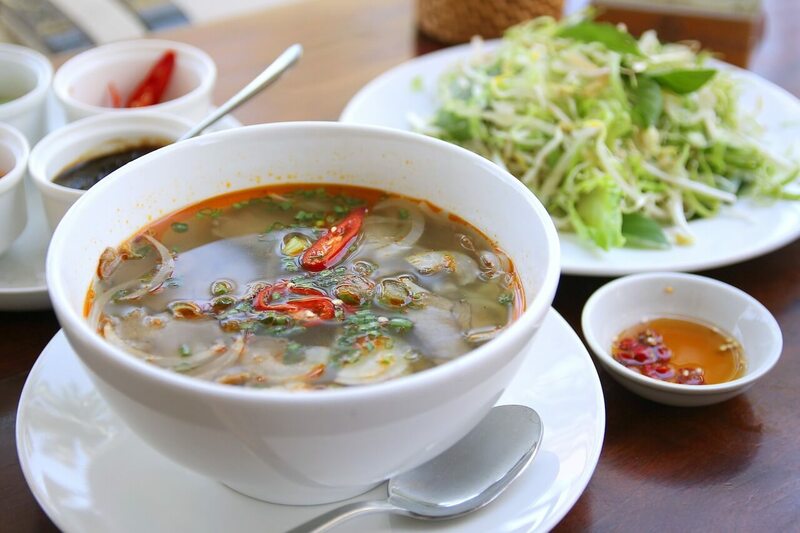 Hu tieu has been a popular dish in Southern Vietnam since the 1950s. It can be said that Hu tieu is a typical dish in Saigon, similar to Pho in Hanoi. 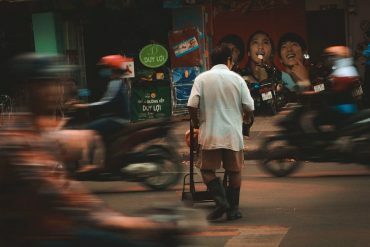 Hu tieu can be found easily on the street or at the corner of the alley, and Saigonese usually has Hu tieu for breakfast or dinner. There are many types of Hu tieu, but the most famous one is hủ tiếu Nam Vang which is originated from Cambodia. 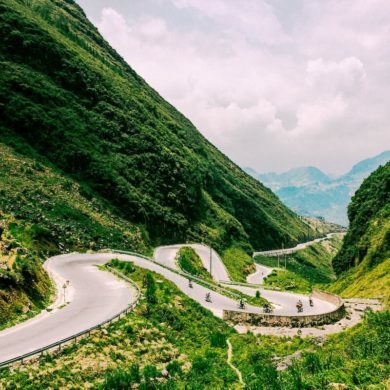 What is in Hu tieu? 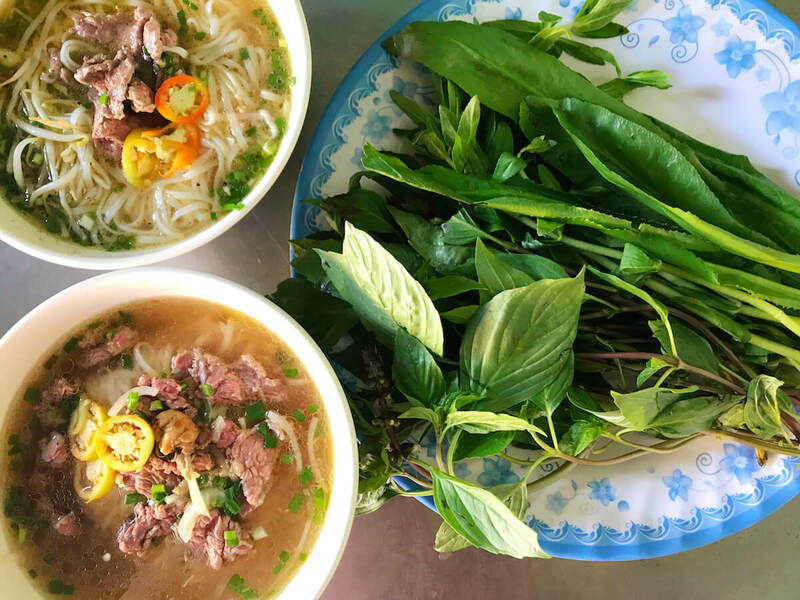 A bowl of Hu tieu usually includes broth, shrimp, pork, minced meat, noodles, and served with lettuce, chives, and fresh herbs. Besides pork and shrimp, diners can enjoy Hu tieu with other ingredients such as crab, squid, etc. Spring roll with meat and shrimp is one of the most common versions of Goi Cuon. How to make Goi Cuon? 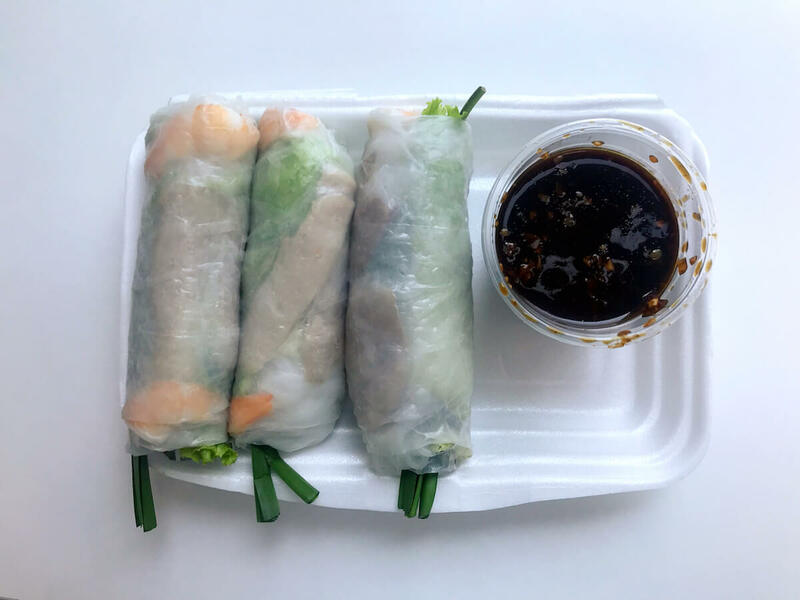 The dish consists simply of a slice of boiled pork belly, a large shrimp, vermicelli, a lettuce leaf, and chives wrapped carefully in Banh Trang (rice paper). Rice paper is an indispensable ingredient of Goi cuon. Before wrapping, Banh trang (rice paper) is dipped quickly into the water so it can stick to the outer layer. 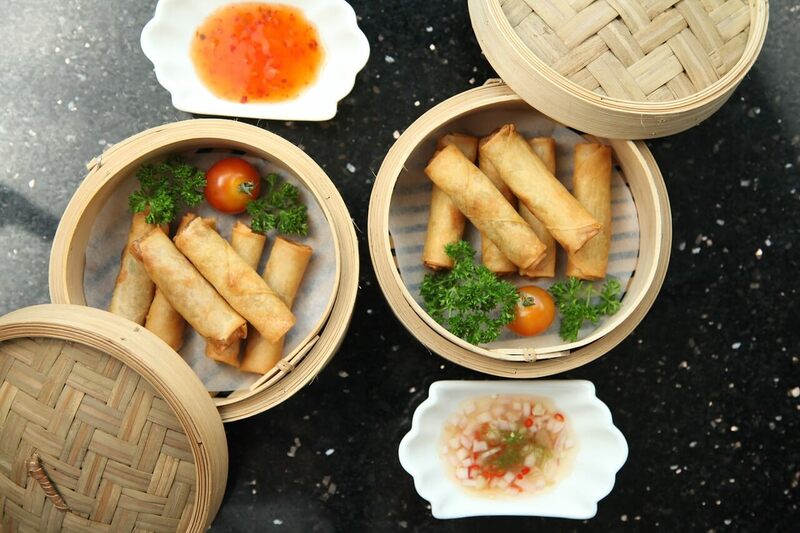 The clear white color of rice paper makes the spring roll more attractive as diners can see the ingredients. How to eat Goi cuon? Goi cuon can be eaten with Nuoc mam (fish sauce) or Hoisin sauce. A few slices of chili and roasted peanut are usually added if you choose the Hoisin sauce. When you eat, you can feel the chewy taste of rice paper together with the rich fatty flavor of pork, the sweetness of the boiled shrimp, the bitter but fresh of veggies mixing with a sweet taste of the sauce. Cha gio, or Nem rán (in the North), is a fried version of Gỏi cuốn. Depending on the region, people will use different ingredients to make Cha gio. In general, these ingredients will be mixed with spices and wrapped in a slice of rice paper, then fried until the color of rice paper turns crispy and golden brown. Cha gio is eaten with sweet and sour sauce, along with fresh veggies and herbs. Com tam is the rice dish cooked from broken rice named Tấm. Tấm is the first part of the rice kernels, and the rice got broken while in the process of milling. This is the main ingredient of this dish and can not be replaced by any other type of rice. Grilled ribs, egg, and pigskin are served together with the rice. The ribs are spiced with a rich flavor, providing an aromatic taste, with a crispy outer layer but soft and juicy inside. The rice dish is topped with geese onion, cucumber and tomatoes slices, and pickles made from carrots and radishes. 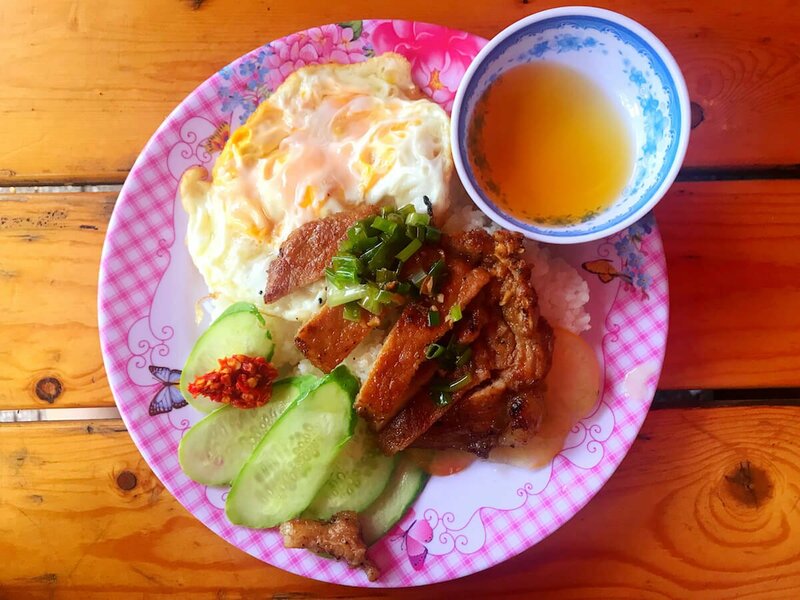 Like other dishes, Com tam must be served with sweet and spicy fish sauce. 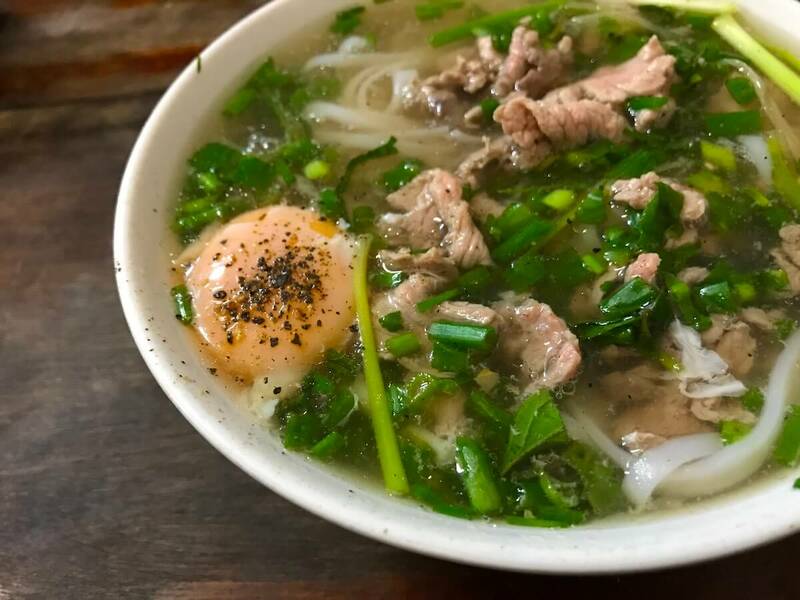 Banh canh is a simple but delicious dish including thick noodles, tasty broth made from bones or seafood and other ingredients such as boneless fish, fish balls, pork rolls, shrimp or meat. The thick noodles are made mainly from rice flour, tapioca flour or the mixture between both. Xoi, or steamed sticky rice, is a familiar dish in Vietnam culinary. Xoi is prepared simply and varied depending on the region and each person’s taste. But in general, sticky rice is divided into two types: Xôi mặn (with meat) and Xôi ngọt (without meat). 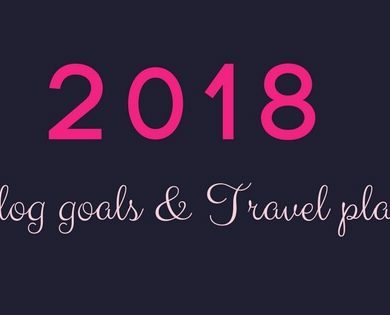 The most popular sticky rice are Xôi gà (chicken sticky rice), xôi gấc (red sticky rice), xôi đậu phộng (sticky rice with peanut), xôi đậu xanh (sticky rice with beans). 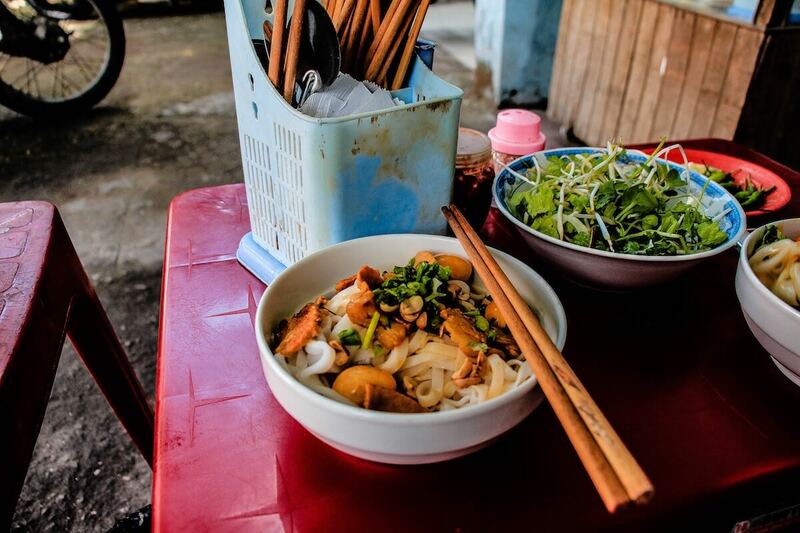 Mi Quang (Quang noodles) is a tasty noodle dish from Da Nang – Quang Nam region. Quang noodle is usually made from noodles with finely grated rice flour and thinly sliced with approximately 2 mm thick. Under the noodles are raw vegetables, and on the top, the noodles are lean pork and shrimp along with broth are stewed from the bones. It’s also added roasted peanut, parsley, chopped green onions, herbs, red peppers … Unlikely other Vietnamese noodle soup, the broth is usually very little for this dish. A traditional bowl of Mì Quảng is only with shrimp with meat (indeed delicious enough to love it), but today there are also many variations. From chicken, beef to crab and frog, they can be used to make Quang noodles. In Southern Vietnam, the name “Bun thit nuong ” is widely known, but in the North, people use “bun cha” to indicate this delicious food. Depending on each region, this dish has a certain difference and this feature is shown in the shape of meat as well as how it was sliced. 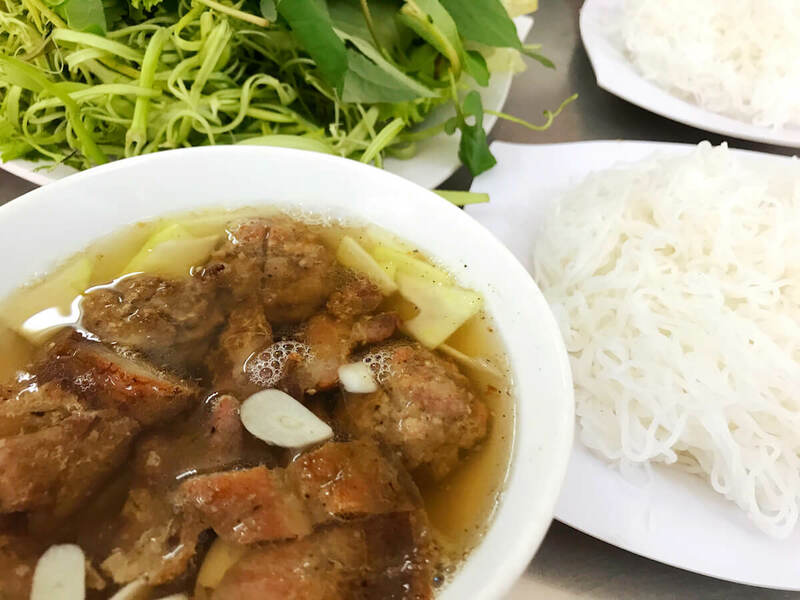 Bun thit nuong is often presented with thin slices of grilled pork, while Bun cha is served with meatball and square slices of grilled pork. 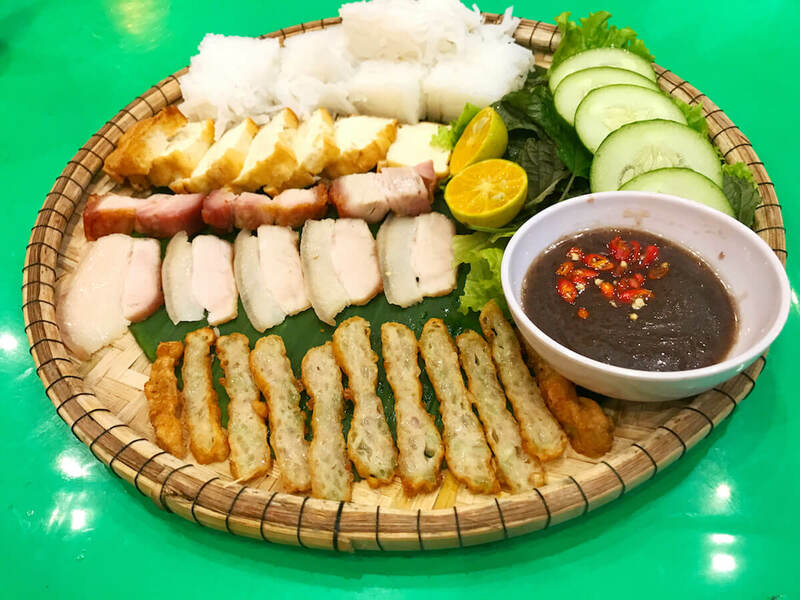 In order to keep the taste and moisture content of the grilled pork, the cook must leave a small amount of fat when slice and shape the meat, so the meat can be more delicious. The traditional meat selection is shoulder meat as it’s the most perfect meat for this noodle dish thanks to its lean texture and the ideal fat content for grilling on the charcoal. 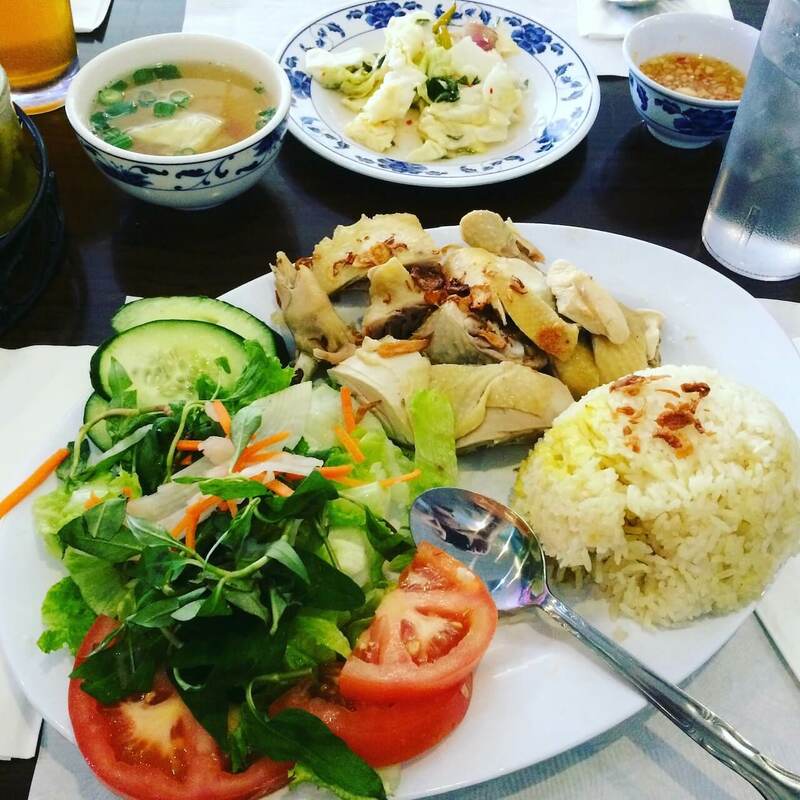 Normally, Bun thit nuong is served with some types of fresh vegetables including bean sprouts, lettuce, basil, mint and fish sauce. 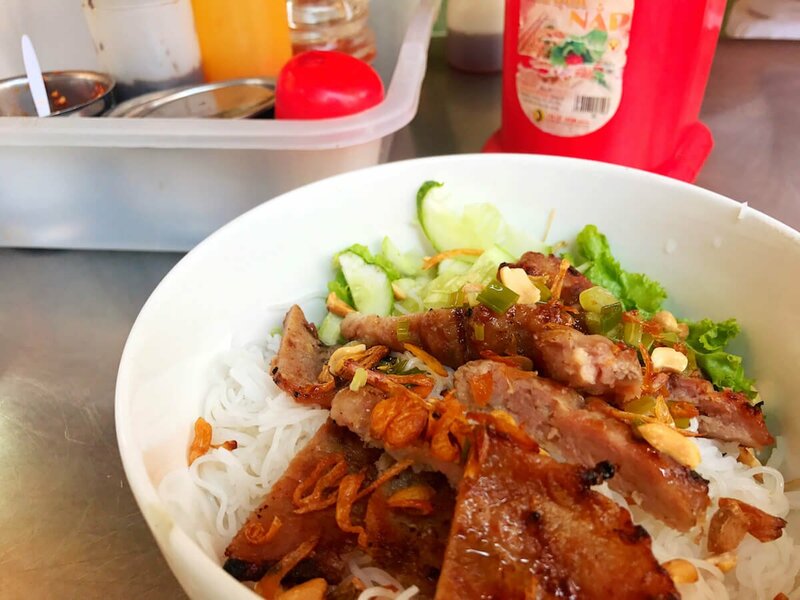 Bun thit nuong is usually served in a bowl with a layer of fresh vegetables, a layer of vermicelli and topped with roasted meat and then added a little bit of roasted peanut and green onion. Finally, fish sauce will be sprinkled before eating. However, Bun cha is presented in a different way, in which vegetables and vermicelli are placed in different bowls. Grilled meat and fish sauce are served in two separate bowls. 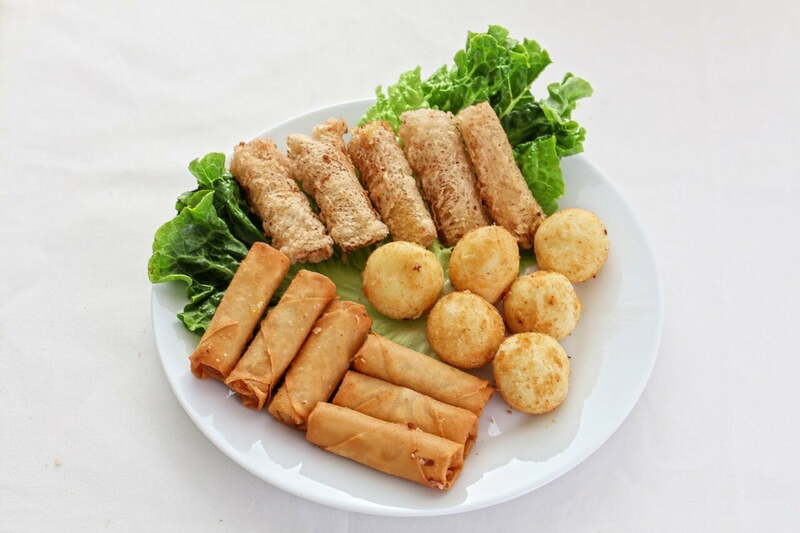 When eating, diners will first dip the grilled meat into dipping sauce, then eat with vermicelli and vegetables. Bun dau mam tom is Hanoi’s specialty which is served with shrimp paste. 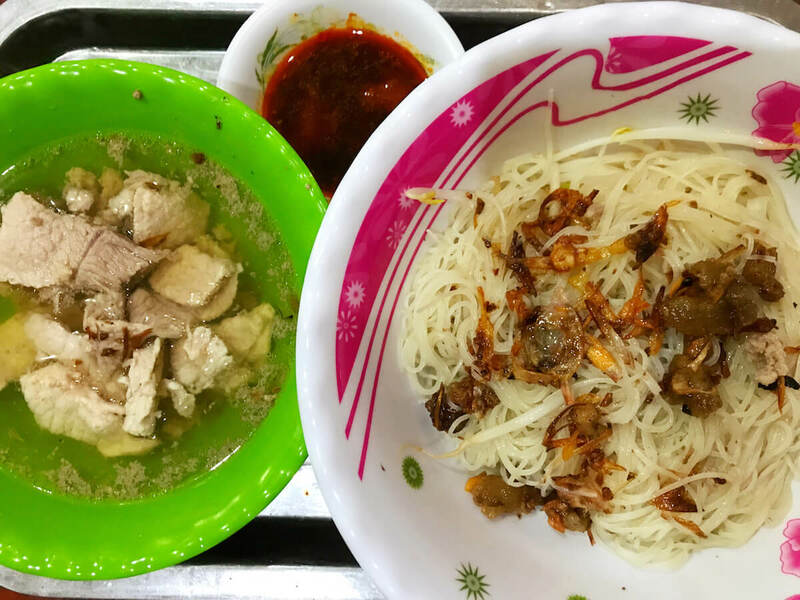 A portion of Bun dau mam tom includes basic but tasty dishes: Rice vermicelli, crispy-fried tofu, sliced pork belly, Hanoi fried fish cake, and fresh herbs. Mam tom (shrimp paste) can be smelly and taste strange, so you can ask for the fish sauce instead. Bun bo Hue, or bun bo, is a popular Vietnamese soup originated from Hue. 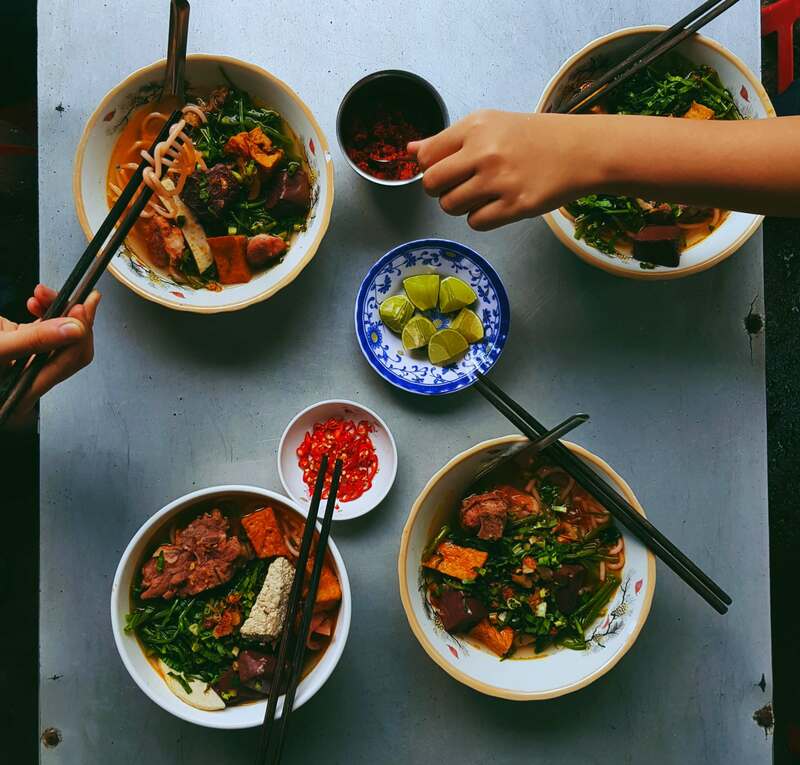 Although it is called as bun bo (rice vermicelli with beef), Bun bo Hue also includes a pork belly, a piece of boiled pork leg, crab meatball or beef ball. The soup is also really special. You can taste spicy, sour, salty, and sweet all at once. Along with beef noodle bowl, there is also a plate of vegetables including bean sprouts, basil leaves, sliced banana flowers, lemon and chili slices. The dish is colorful with the green of vegetables, the red of chili, the yellow of crab and the white of noodles. Bun rieu is a popular Vietnamese noodle dish with crab base soup and tomatoes. You can order this dish with fish (Bún riêu cá) or shellfish (Bún riêu ốc), but the most common one is Bún riêu cua (with crab). The main ingredient of Bún riêu cua is the minced crab, tomatoes, and fried tofu. Some places also offer pork leg or pork as an additional ingredient for your soup. Bun rieu is often eaten with Rau muống (morning glory) and other herbs. Banh mi is known as one of the best Vietnamese street food. 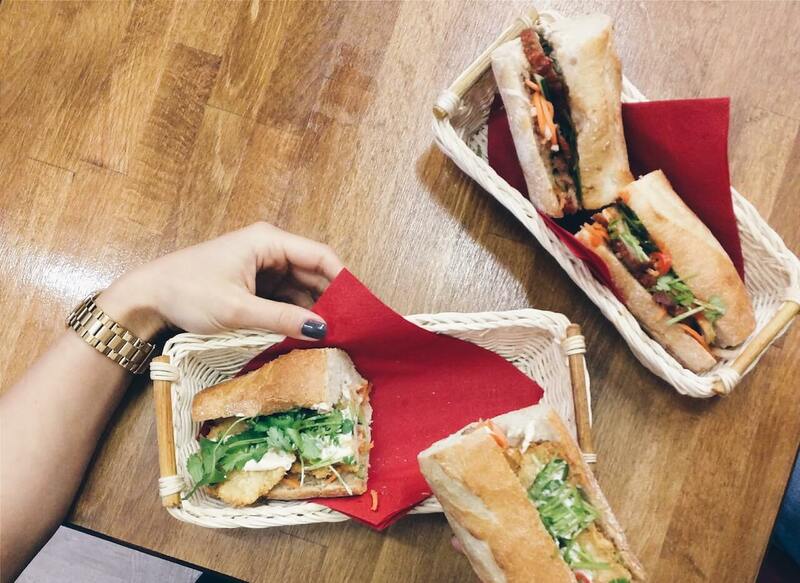 Banh mi is everywhere. You can find Banh mi in most of the corner of the street. The special and delicious taste of Banh mi is not only from the crispy bread crust and soft crumb but also from the variety of flavors and filling. The filling varies from omelette, roasted pork or chicken to fish balls. Banh mi is usually added with some cucumber slices, white radish, pickled carrots, cilantro, coriander, and some spicy chili. Banh xeo is a Vietnamese version of the crispy pancake. The word “xeo” represents the sizzling sound when pouring the mixture into the hot skillet. The yellow color of Banh xeo’s outer layer comes from the turmeric powder in the rice powder mixture. Banh xeo is filled with boiled pork strips, shrimp, and bean sprouts. The Banh xeo version of Central Vietnam is crispier and smaller than the one in Southern Vietnam. How to eat Banh xeo? The best way to enjoy Banh xeo is eating with your hands. 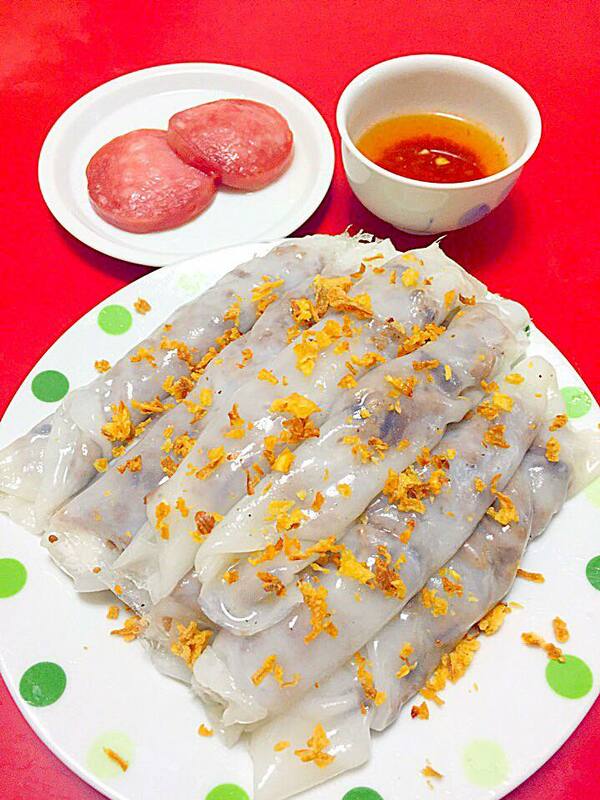 You should wrap Banh xeo with Banh trang (rice paper) and vegetables, then dip it in Nuoc mam (fish sauce). Banh cuon, or Vietnamese steamed rice rolls, is another must-try Vietnamese food. The soft piece of cake rolling with minced meat, wood ear mushroom and dried onions sprinkle topping always attracts every food lovers. The dish is usually served with chả lụa (Vietnamese pork sausage), sliced cucumber and veggies with the fish sauce as a dipping sauce. 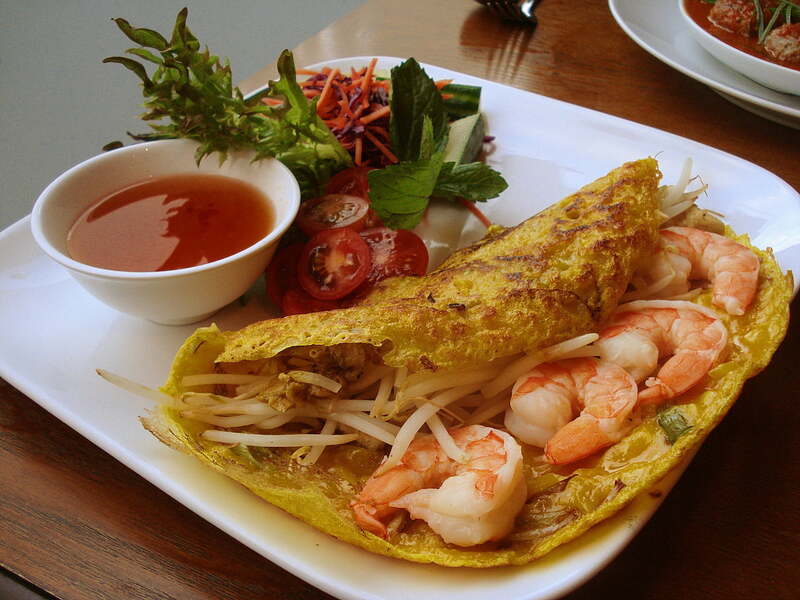 Rice paper is an important ingredient in Vietnamese food. 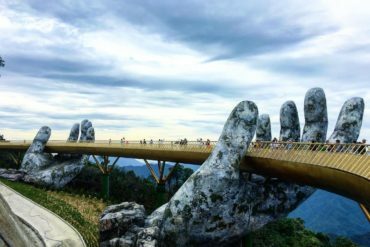 It will be a shortcoming if not mentioning the famous rice paper of Tay Ninh: Bánh tráng phơi sương Trảng Bàng (rice paper frost). The name of it is based on how to make rice paper. The rice must be soaked overnight, then ground into powder and made into rice paper. 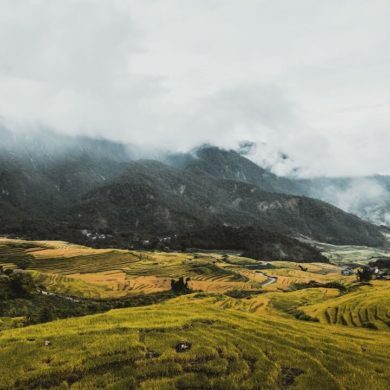 The rice paper must be put outside and exposed to the night to keep the rice paper soft and flexible, so the new people called rice paper frost. 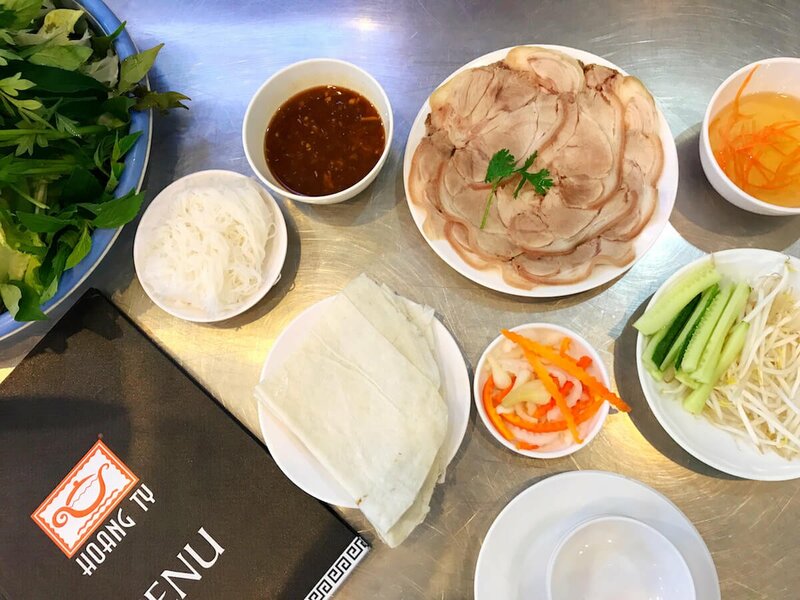 The delicious combination of Trang Bang rice paper frost with boiled pork and vegetables makes this specialty become a popular Vietnamese dish. 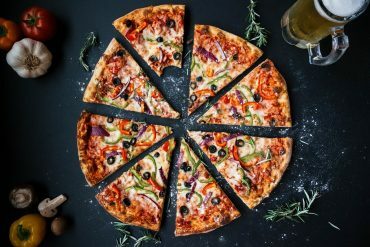 The vegetables used in this dish has different flavors: sweet, sour, and aromatic, including types of lettuce, perilla, chives, guava leaves, basil, etc. Banh khot is a popular Vietnam dish originated from Vung Tau, Vietnam. Topped with shrimp, this mini pancake is crunchy and rich with coconut milk flavor. Banh khot is served with dipping fish sauce and vegetables such as lettuce, perilla, and papaya fiber. Banh beo, or water fern cakes, is a special dish from Hue. Wandering around Hue, you can find women walking leisurely with lightweight bundles serving Banh beo. Made from a combination of rice flour and tapioca flour, this dish is topped with green bean paste and minced shrimp. Its deliciousness comes from minced shrimp filling and the special sauce. Mixed with sugar, garlic, chili, and cooked fresh shrimp, the fish sauce is rich in taste. Another Hue’s specialty is Banh bot loc. 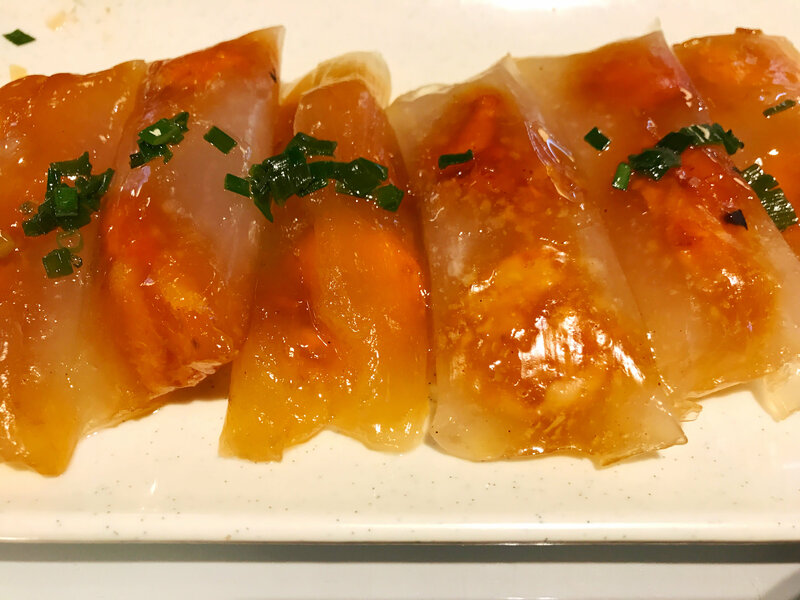 Made from tapioca powder, this dish is chewy and rich in taste with shrimp filling. Shrimp will be cooked to medium, and the stir-fried shrimp sauce in the pan will be retained for use as a part of dipping sauce. Sometimes people add minced pork and wood ear mushroom to the filling. Banh bao, or steamed pork bun, is one of the most popular Vietnamese street food with fluffy exterior and savory filling. The most popular filling is seasoned ground pork with mushrooms, vegetables, and eggs. 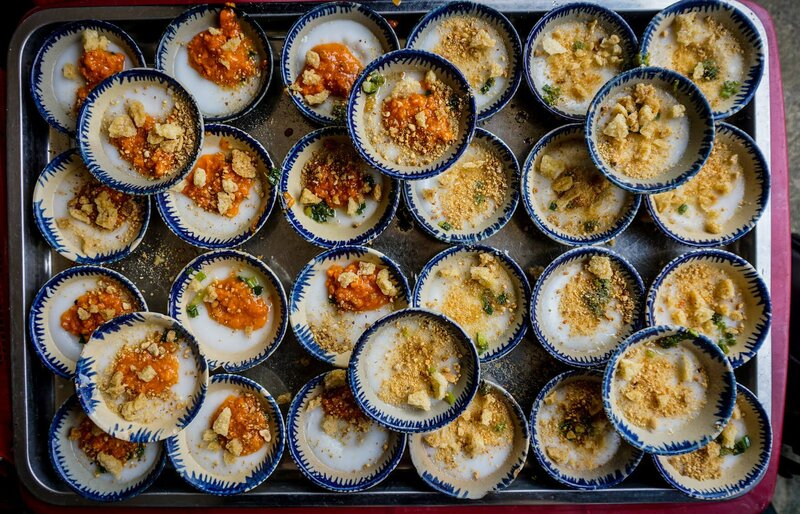 You can find a vegetarian version of Banh Bao, which is Banh Bao cade (custard fillings). The most common color of Banh Bao is white, but you can find one with a light green color (Pandan color) or yellow as well. 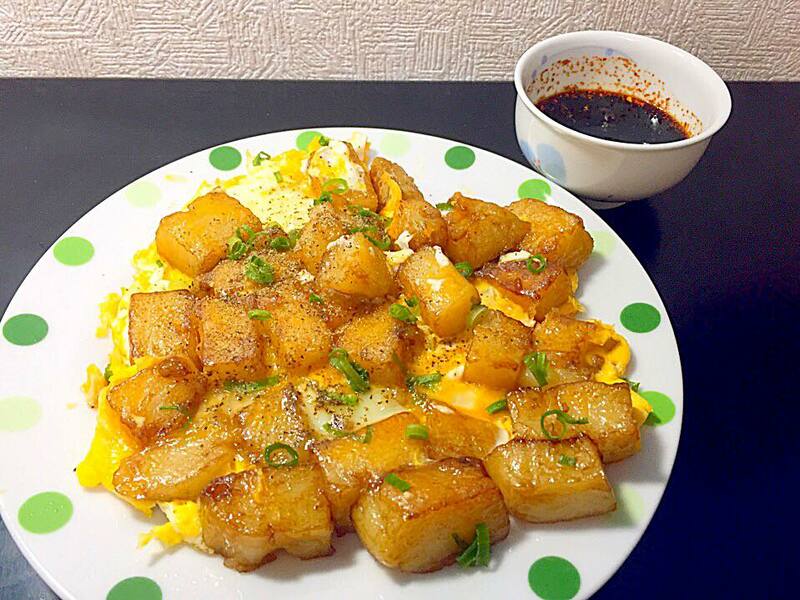 Made from rice flour, Bot chien is a fried rice cake topped with eggs and scallion. Bột chiên attracts food lovers with the golden crispy fried cake outer but still soft inside.